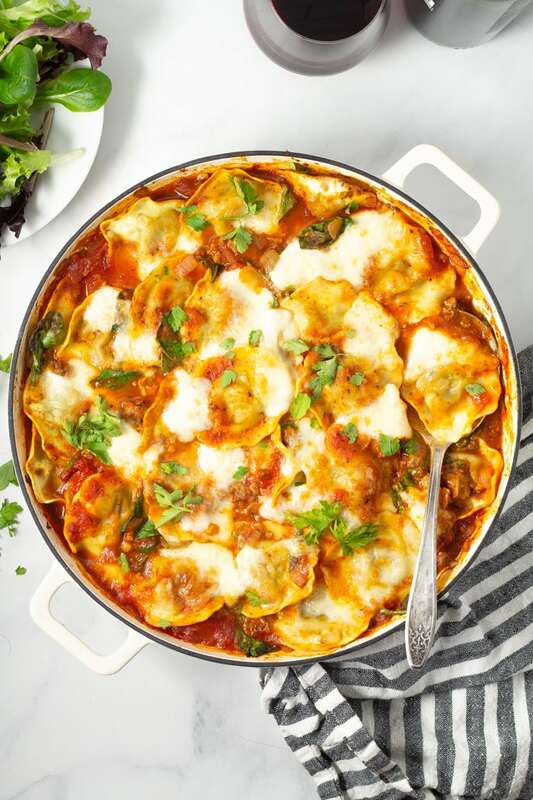 A cross between lasagna and baked ziti, this ravioli dish comes together in just one pan and goes from stove top, to oven to your dining room table in less than 30 minutes! 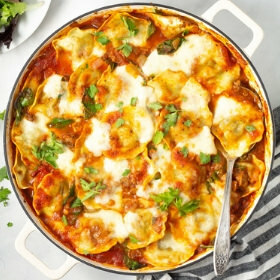 How do I make baked ravioli? A quick saute of onion and garlic with dried oregano will start the flavorful base. Then brown some spicy Italian sausage and pour in a splash of red wine. Add your store bought pasta sauce. Prego is my jam. We all have our favorite store bought brand, right? Then stir in spinach because we all need eat more veggies, right? Add ravioli and stir to combine. Add fresh mozzarella and bake until bubbly, melty and delicious. This is one of those meals that you can easily throw together after a long day and have dinner in the oven in just 10 minutes. Which is why it’s my favorite! Do I have to boil the pasta in this baked ravioli? Nope! No boiling, no straining, no extra dirty dishes! The ravioli will cook right in the pan with the sauce and cheese! 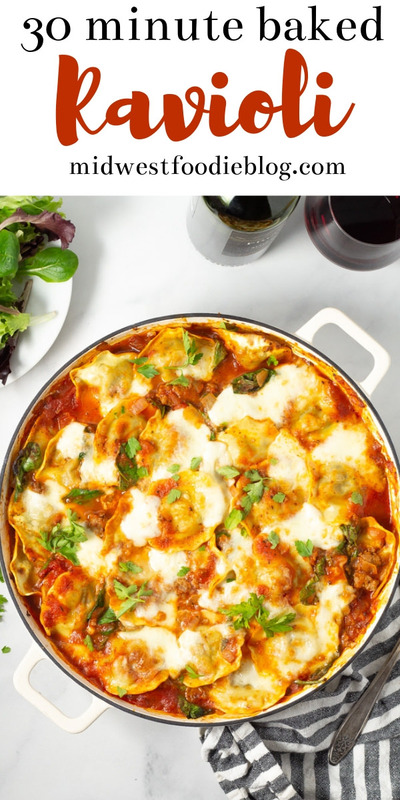 The red wine not only adds flavor but also adds enough liquid that the ravioli will cook through along with the moisture of the pasta sauce and spinach. Just be sure the ravioli is entirely covered by sauce so that it cooks evenly and all the way through. What kind of ravioli should I use for this recipe? I like to use Giovanni Rana mushroom ravioli. 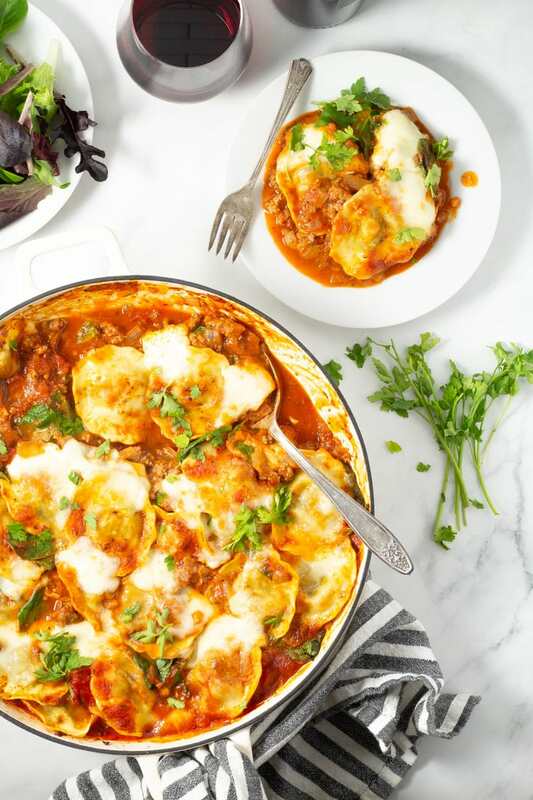 It cooks in just 4 minutes (when boiled) which makes it perfect for this baked ravioli recipe. You could also use any of their other ravioli or even tortellini refrigerated pastas. And no, this is not a sponsored post. I just love their products because they taste great and cook quickly. 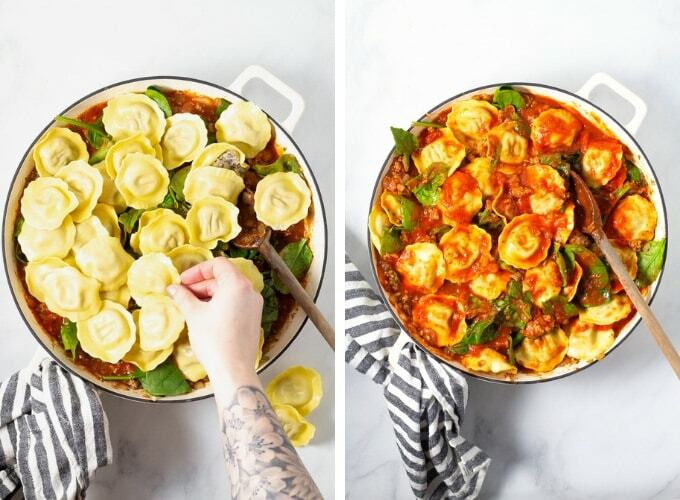 Keep in mind if you’re using another brand of refrigerated ravioli (Butoni for example) you may need to bake the dish for a bit longer as the ravioli may have a longer suggested cook time. Can I make baked ravioli ahead of time? Yes! Feel free to make this up to two days in advance and refrigerate until you’re ready to bake. Be sure to allow the ravioli to sit out on the counter for about an hour before baking so that it can come to room temperature. Then just bake as directed and enjoy! 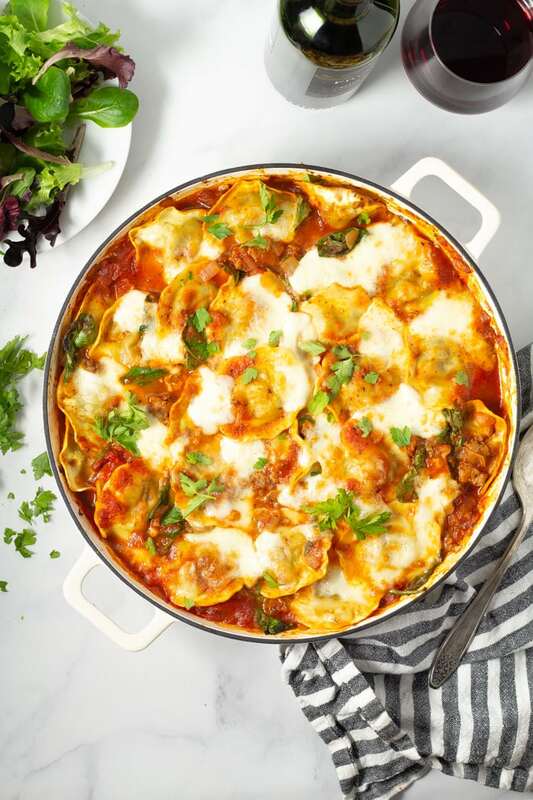 A cross between lasagna and baked ziti, this ravioli dish comes together in just one pan and goes from stove top, to oven, to your kitchen table in less than 30 minutes! Heat olive oil in a wide, shallow dutch oven style casserole dish over medium heat. Add onion and large pinch of salt and pepper. Cook, stirring frequently for 3-4 minutes. Add garlic and oregano and cook for another minute, stirring frequently. 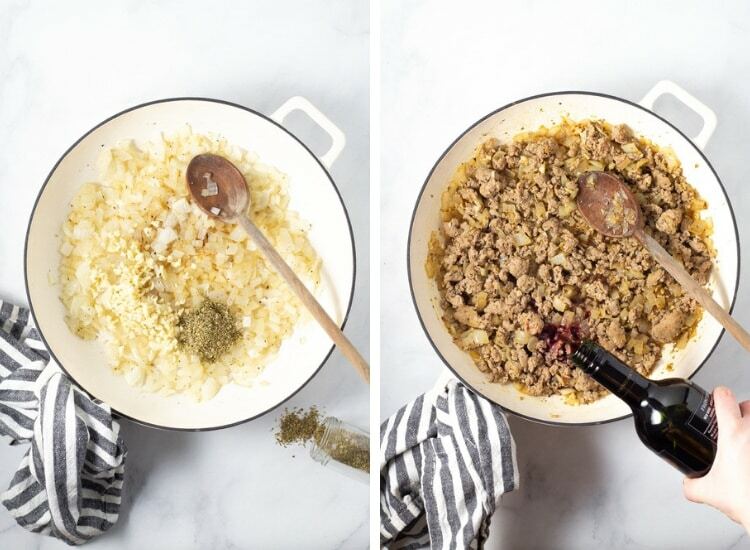 Add sausage and cook, crumbling with a wooden spoon, until browned and cooked through. Stir in red wine and pasta sauce. Then stir in fresh spinach. Add ravioli and stir until it’s well coated in sauce. Be sure each ravioli is nestled into the sauce so it cooks evenly. 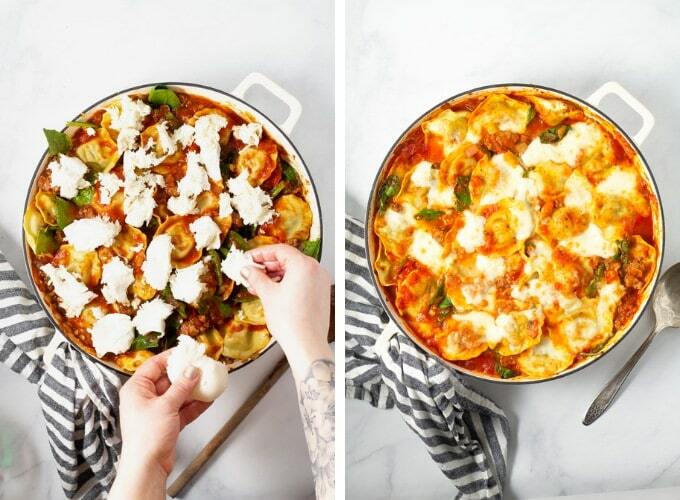 Tear mozzarella into chunks and place on top of ravioli in a single layer. Bake for 20 minutes or until the ravioli is al dente and the sauce is bubbling. Broil for 1-2 minutes to brown the cheese on top. This looks delicious! We loved ravioli/tortellini. My biggest challenge is keeping my daughters occupied while I cook! After being in daycare and away from me all day, they don’t like to let me cook solo! And they’re not big enough to be helpful. I made this for dinner tonight and it was delicious! I left out the sausage because I’m vegetarian, and used spinach and ricotta tortellini, but otherwise stuck to the recipe. I love how rich the red wine makes the sauce taste even though it cooks for such a short time. This was the perfect fancy-ish meal to cook for my husband and I after we wrestled our two small kids to bed. Quick, easy, and delicious, so it’s win-win-win! My biggest obstacle to getting a meal on the table is our families incredibly busy schedule. After school practices for multiple kids in multiple events get the beat of us. Yes! That seems to be a running theme here!! 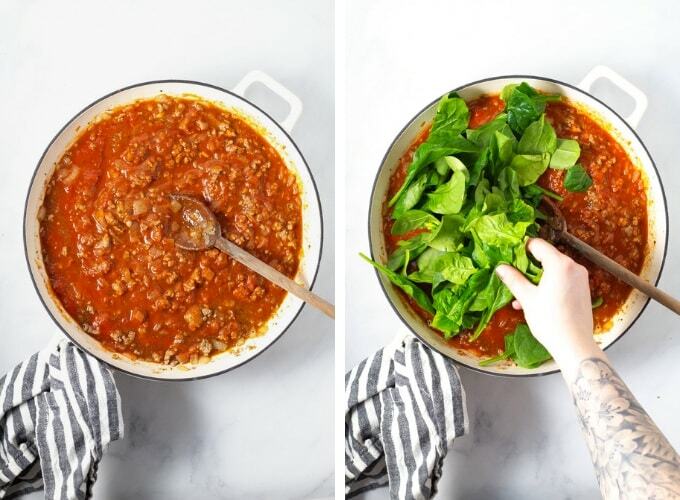 🙂 Thank you for sharing – I’m hoping to find ways to help you overcome these obstacles and I wonder if more crock pot meals (that are family friendly) might be the answer. Thank you for the inspiration! Looking forward to trying the ravioli this week! The biggest obstacle we face at dinner time is preparing meals that accommodate everyone getting home from/leaving for work, practices, activities, etc. at different times. It’s not practical to ‘cook’ three times so the food is hot and ready for each person. Great! Please let me know what you think 🙂 I can only imagine how difficult it is to get dinner ready for family who is going all different directions and different times! My hope in asking this question was to try to help my readers with their obstacles – maybe I’ll have to look at making more crock pot recipes that can be left on the “warm” setting after they’ve cooked so that your fam can come and go as they please and you don’t have to worry about a thing! Thanks for the inspiration Sarah! My biggest challenge is finding vegetarian recipes (for me) that meat-loving hubby will like. I am in the same boat!! While I’m not vegetarian, I make a lot of plant based and veggie heavy meals and my husband’s favorite critique about any dish is, “This would be great with chicken in it…” I’ve found that my husband likes when I add smoked cheeses to vegetarian dishes to give it that meaty flavor!! Can’t wait to make this Friday for “pasta feed” for our kiddos before a big weekend of basketball games. Great idea! It definitely feeds an army! A quick and easy weeknight dinner that your family will love!